Popular Mechanics (PM) next turns to the issue of the plane impacts and fire damage and their roles in the WTC event. 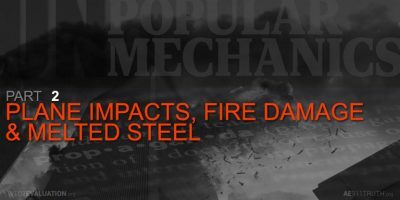 Though PM acknowledges that the fires in the buildings could not have become hot enough to melt steel, the magazine nonetheless rehashes the argument from other defenders of the official story—namely, that the steel did not need to melt to cause collapse. According to PM, the steel only had to be weakened by the fires just enough to cause collapse. PM also discusses the theory from the National Institute of Standards and Technology (NIST) that “the impact stripped fireproofing insulation from the trusses that supported 80,000 square feet of floor space” (pg. 38). PM attempts to make a case that the combination of the aircraft impacts and the ensuing fires were sufficient to cause both of the structures to collapse. Conspiracy theorists point to other high-rise fires, such as the one in 1991 at the 38-story Meridian Plaza hotel in Philadelphia, as proof that fire alone cannot bring down a skyscraper. And, in a sense, they are right: Fire alone did not bring down the towers (pg. 40). It is important to note that the term “conspiracy theorists” is a derogatory term used here to discredit the forensic evidence of controlled demolition brought forward by technical professionals. 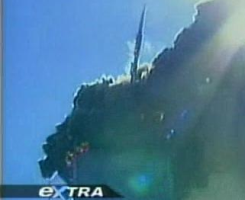 The experts at AE911Truth do not speculate on possible theories regarding who brought down the WTC skyscrapers. In the case of Building 7, the NIST report tells us that structural damage played no role in initiating the collapse of the building, and that its collapse was due to “normal office fires.”5 One then has to wonder why PM does not consider the 9/11 Truth Movement “in a sense right” about Building 7. But that aside, it is important to quantify how the structural damage played a role in the collapse of the Towers. We previously noted that the collapse of the Towers started on floors with less damage than other floors. 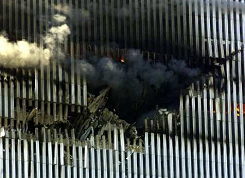 In the case of the North Tower, the collapse started at the 98th floor,6 which had the least amount of structural damage out of all the damaged floors.7 Not only that, but the upper section of the North Tower started to collapse on the side of the building opposite to where the plane impacted. [T]he impact struck out sprinklers and fireproofing, and the fire elevated the temperature of steel. Then you start to weaken the steel by heating it up (pg. 40). When we’re talking about the debris pile and the insulating effect, the fires down there are completely different than the factors [affecting the steel] in the building (pg. 41). The photographs shown to support melting steel are, to me, either unconvincing . . . or show materials that appear to be other than steel. One of these photos appears to me to be mostly of glass with unmelted steel rods in it. Glass melts at much lower temperatures than steel (pg. 41). 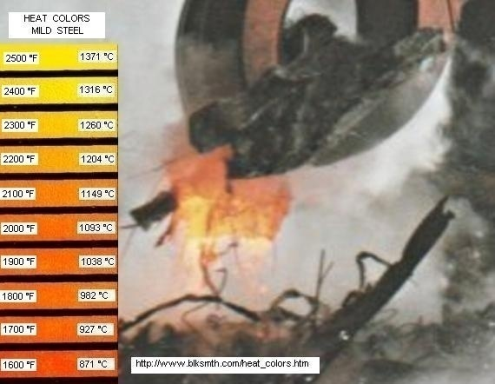 Regardless of whether the obvious molten material shown above is molten steel, iron, or even glass, its color indicates temperatures exceeding 2,300°F. The jet fuel and office fires in the Twin Towers never reached such temperatures. In fact, both the USGS and RJ Lee, an environmental consulting firm, found ubiquitous, previously-molten iron microspheres in all of the WTC dust samples. These, like the thermite, can only be the result of temperatures reaching 2,800°F. Up to 6% of some of the dust samples recovered in the nearby skyscraper, the Deutsche Bank building, are composed of these iron spheres — most of which are only the size of the diameter of a human hair. It is quite evident that PM has failed to explain away the extreme heat and molten metal that clearly existed at Ground Zero. They have also failed to show the temperatures inside the buildings were sufficient to cause collapse. 7 Although it is true that the NIST report never specifically states that the 98th floor was the least damaged, the information provided in their report clearly demonstrates this. The 98th floor had only five perimeter columns severed, and one need only look through the table provided in NCSTAR 1-2, pg. 205 to see that NIST does not list floor 98 as having any of its core columns severed.